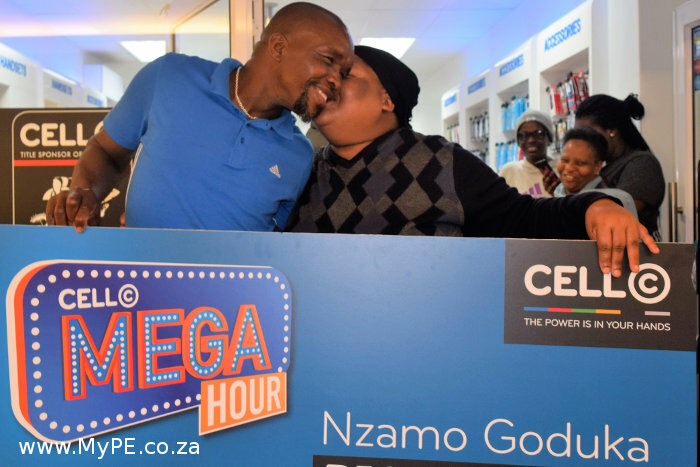 Cell C national Mega Hour winner Nzamo Goduko gets a kiss from his wife Patience Goduko. Nzamo will use the money to buy a house and take his 2 children to university after winning R500 000 in the Cell C Mega Hour competition. Cell C launched Big Bucks, an SMS based trivia competition, in 2012. The competition was very popular with Cell C customers and it ran for three seasons up to December 2013. In 2014, for the fourth season, Cell C decided to rebrand and relaunch Big Bucks – and Real Deal was born. One of our longest seasons, Real Deal 3 ran for 6 months and ended on 31 December 2015. Over 1.3 million customers took part in the competition. The trivia competition has become a regular feature over the years as Cell C customers enjoy challenging themselves with the general knowledge questions as well as winning prizes. The trivia competition is only open to Cell C customers as a way for Cell C to reward customers for their loyalty. In 2016, Real Deal was renamed Mega Hour. The competition ran for 60 days from 20 July and ended on 17 September 2016.